Long Stay travel insurance policies are designed to cater for the needs of those who are leaving the UK for at least a month, and can cover trip lengths up to a typical 18 or 24 months. 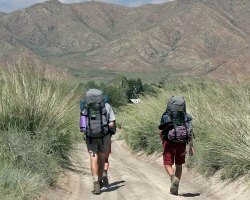 Whilst backpacker policies are targeted at travellers in their teens, twenties and thirties, long stay policies tend to be bought by more mature travellers and, as such, sell themselves less on extreme activity cover, but more on being able to cover older travellers and those with medical conditions. If you have had a previous condition it is important to ensure it's covered by your insurer - especially if you are likely to be out of the UK for a significant period - as not declaring a historic medical condition can, in some circumstances, cause considerable concern. Our table below also details the cover offered for a few activities, as many policies will cover you for an African safari or a less extreme white water rafting event, should that be your intention! We do regularly check the details of policies featured, but as companies can amend or change details at a moment's notice please do double check all the details before purchasing. Product compared is the Gold Long Stay policy available through our link - Top Dog also sell less comprehensive policies via other comparison sites. These policies are ideal for those off on a round the world trip, visiting relatives abroad or who own a property in warmer climes which they travel to over the winter. However it's worth thinking through a few eventualities before settling on any one policy so you can identify the kind of features that ensure you get most benefit from it. Does my longstay policy allow me to return home during my trip? Even if you are not planning to drop off back in the UK during your trip, events can occur which make such an eventuality necessary. Some policies automatically expire immediately you return to the UK, even if you have bought a policy covering a longer period. Others allow one return visit or more. Will my policy cover my planned activities? Some policies cover 100 or more activities without extra charge, others don't. Make sure you are covered for what you want to do and that your longstay insurance policy does not exclude activities from your policy. Declare your pre-existing medical conditions! If you are going away for a long time it's not worth the risk that a seemingly minor condition could invalidate your policy. Many insurers will allow you to declare pre existing medical conditions, and minor conditions can cost little or nothing to cover. If, however, you are struggling, call one of the companies on our Pre Existing Medical Condition Travel Insurance page and they will be delighted to cover your trip. If so, check your longstay travel insurance policy carefully to make sure that this is covered. If you are taking any valuable items with you (such as cameras, laptops, jewellery, ipads or mobile phones) check the policy limit. It may be necessary to get these covered under a specialist gadget insurance policy or through your home insurance. Most gadget insurance policies will allow you to insure a gadget for up to 90 days abroad, although this can rise up to an unlimited period (as long as your permanent residence is in the UK) for laptops. Compare gadget insurance here.